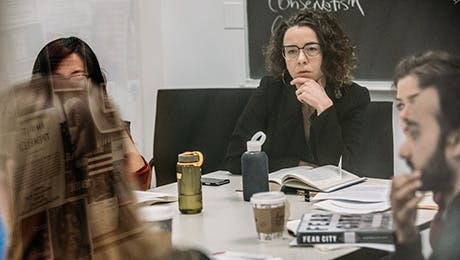 Courses in the Department of Economics combine abstract theory with concrete statistical analysis for a more nuanced and accurate understanding of important issues. Our classes offer the study of different schools of economic thought, explored for both historical context and modern importance. Industrialization and financial crisis are interlinked in the story behind East Asian success. These developments require placing the Chinese transition in context as much as it is important to look into the integration of Southeast Asian economies in global production networks that have now come to define the region. The role of the Association of Southeast Asian nations is key to the intensification of negotiations around a regional integration. Export processing zones and home-based work in supply chains are discussed from a feminist lens. Social justice movements are also important players in relation to democratization of developmental states and fragility of Southeast Asian democracies. This course critically examines the causes, consequences of racial disparities and social policies to address these disparities. Although it has been nearly 150 years since the emancipation of black Americans and nearly 40 years since the passage of civil rights and equal employment opportunity legislation, blacks still lag far behind whites in virtually every socioeconomic indicator. The course explores the merits and limitation of various paradigms aimed at explaining these persistent disparities. In particular, the course investigates racial disparities in various socioeconomic indicators such as education, labor markets and wealth. The course is divided into four parts: (1) an introduction to the biological and social construction of race and the problem of racial disparity, (2) conservative, liberal and alternative paradigms that explain racial disparity, (3) an examination of racial disparity in education, labor markets and wealth, and (4) policy solutions, such as affirmative action, reparations, and other policies to address racial disparities. This course provides a basic understanding of the social and economic roles of derivatives in finance capitalism. The current debates over neo-liberalism have raised the question whether the tremendous increase in the “value” of derivatives over the last 40 years (from a notional annual value estimated in the tens of millions in the 1970s to current estimates of over a quadrillion dollars) represents a qualitative change in capitalism or just a quantitative increase brought about by deregulatory policies that gave rise to an expansion of speculative capital and its excesses. In order to answer this question, the first part of the course will provide an introduction to derivative finance by looking at what is considered to be its starting point and innovative core, the Black-Scholes formula. This course provides an introduction to the history of classical economic thought. Classical economics provides important building blocks for an understanding of modern capitalism, because it attempts to integrate its economic analysis with social class, income distribution, real competition, technological change, the world economy, and with the historical place and limits of industrial capitalism. As such, it may help broaden and challenge the analytical scope of much contemporary economic thought. This particular course is the first of a two-part sequence, and focuses on Smith, Ricardo, and Marx, and on salient discussions and elaborations of their work. Labor Economics I is a graduate survey course in labor economics. The course aims to survey the classic topics in labor economics to prepare students to engage in original research and teach labor economics in several economic traditions. The successful student will be able to distinguish between several schools of thought in labor economics: neoclassical, institutionalism and radical political economy. Specific objectives include understanding modern research methods in labor economics and the dominant and heterodox models of labor markets. Students will be able to explain the most important labor market outcomes using various analytical frameworks including ones that assume varying degrees of market power, full employment, and constraints on choice. Some labor union history, regulatory issues will also be covered. he objective of the course is to enable students to conceptualize, perform, and critique statistical analyses from a Bayesian perspective on an advanced level. The course covers the statistical and computational foundations of Bayesian model estimation and evaluation. The first part of the course reviews the basics of probability theory, compares the Bayesian and frequentist approaches to statistical inference, discusses methods of model checking, evaluation and expansion, and introduces advanced posterior simulation methods. The second part enables students to estimate and evaluate linear and non-linear models of cross-sectional, time series and panel data. The aim of the course is to provide a thorough understanding of the theory underlying Bayesian inference, which is sought to be achieved by following a hands-on approach to modeling and computation. Students are required to work through numerous examples drawn from real applications and research using the free software packages R and Stan.